What Hath Bee Movie Wrought? Bee Movie—Dreamworks’ 2007 animated cult classic that details the romance between a bee (Jerry Seinfeld) and a human woman (Renée Zellweger)—has long served as the inspiration behind the internet’s weirdest memes. Recently it’s paved the way for something that transcends Bee Movie—something absurd, an artful and heroic exercise of futility and devotion. Something notably hollow. 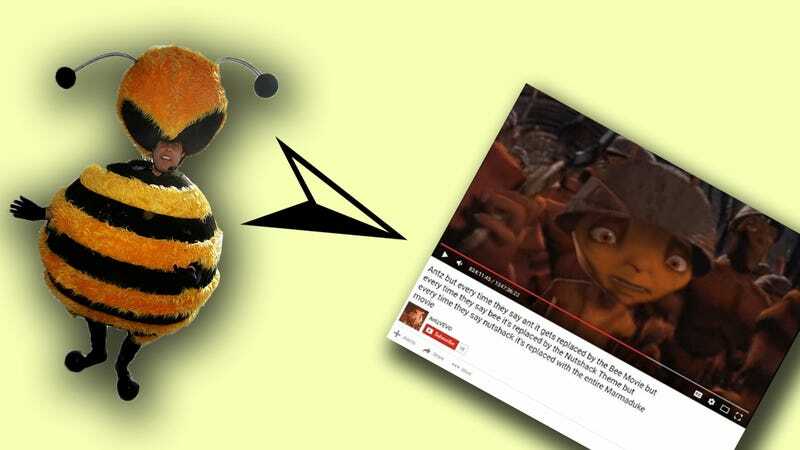 In November, YouTubers began methodically remixing Bee Movie and its trailer into absolute gibberish. A funny absurdist idea that kept building on itself, soon reaching the point of no return. Now, we’ve moved past Bee Movie—people have been meticulously re-crafting choice pieces of pop culture using similarly nonsensical rubrics. The results are a sort of 21st century dada experiment—deeply pointless, sort of confusing, and interestingly astute. Not all the video remixes even exist, but in the case of this meme—what do we even name it?—it’s the concept that counts. The core notion is simple—re-editing various pieces of pop culture based on a set of inane rules that make no sense. These edits are time-intensive, involving a lot of mental power to create something ultimately futile, something that destroys any sort of coherent narrative. It’s a good meme because it reminds you how dumb, pointless and incredibly fun things can be. A century ago, they would have called this art.